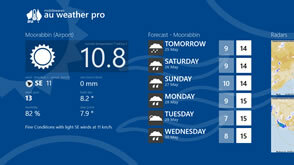 View the latest Australian Weather observations, forecasts, radars, tide predictions and more - with accurate data direct from the BOM (Australian Bureau of Meteorology) - wrapped lovingly in a Metro themed UI. 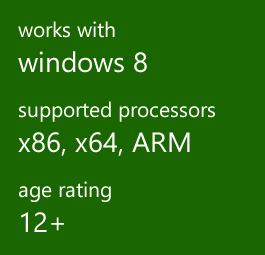 Now you can say 'goodbye' to other Apps using inaccurate and misleading US based weather sources. 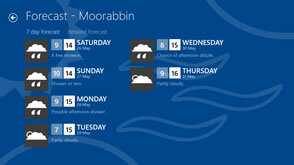 This 'Release Preview' app brings you a huge swath of features based on the #1 selling Windows Phone weather app in Australia. 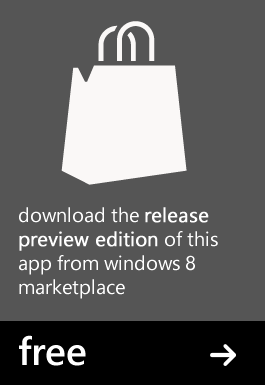 This version is free for you to enjoy – so grab it today and take it for a spin - and have a taste of some of the features you'll get in the full release (available closer to the Windows 8 GA release). AU Weather brings you all the weather data you could possibly want – with information feeds from over 550 BOM Observation weather stations, over 350 forecast stations and covering the vast network of BOM Radar points (for animated IDR, wind Doppler, rainfall and satellite imagery). * Data is provided as per public offerings from the BOM – and as such some weather stations may not provide a complete set of metadata. Use the search charms to quickly locate locations by suburb, postcode and keyword - or use the inbuilt favourites system to mark all your most commonly view observations, forecasts and radar locations for quick access from the start page. Easy to use settings pages (via the settings charm) allows you to customize your locations and nominate the data freshness settings. Please note that AU Weather Pro will use a data connection and consume bandwidth when accessing weather data and viewing online warnings. Location services are used in this app purely to locate the best locations for you when searching and configuring your app. Your actual location information is not stored or transmitted to any 3rd parties directly by this App.